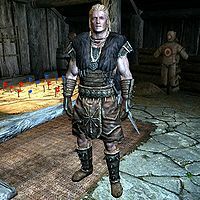 Thorygg Sun-Killer is a Nord soldier and the leader of the Falkreath Stormcloak Camp. He commands nine soldiers, of which three are wounded, and a quartermaster. If you've joined the Imperials, Thorygg and his soldiers will attack you, but Thorygg is still essential and thus unkillable. This page was last modified on 7 April 2014, at 00:21.